The Foreigner is a 2017 political action thriller film directed by Martin Campbell and written by David Marconi, based on the 1992 novel The Chinaman by Stephen Leather. The British-Chinese co-production stars Jackie Chan, Pierce Brosnan, Michael McElhatton, Liu Tao, Charlie Murphy, Orla Brady and Katie Leung, and follows a businessman who seeks revenge for the death of his daughter. The Foreigner was released in China on 30 September 2017, in the United States on 13 October 2017, distributed by STXfilms, and in the United Kingdom in December 2017 on Netflix. It grossed $145 million worldwide and received mixed reviews, although critics praised the against type performances of Chan and Brosnan. Ngoc Minh Quan, a former Vietnam War special operations forces soldier, runs a Chinese restaurant called Happy Peacock in London with his business partner Lam. When his teenage daughter Fan is killed in a clothing store bombing, he seeks revenge. The bombing is claimed by a group calling itself the "Authentic IRA". Failing to get the names of the bombers from Scotland Yard, Quan next focuses on the Northern Ireland deputy First Minister Liam Hennessy, who speaks publicly about his status as a former IRA leader while condemning the bombing. Quan eventually leaves for Belfast and seeks out Hennessy, who claims to have no knowledge of the bombing or its perpetrators. Quan does not believe him and sets off a homemade bomb in Hennessy's office as a threat unless he gets the bombers' names. Hennessy tries to identify the bombers with help from his contacts, but the rogue members catch on and outwit him. Quan observes Hennessy seeing his mistress, Maggie, and photographs them. Quan then brings the fight to Hennessy, hiding in the woods outside his Belfast farmhouse and attacking it with more explosives. As Hennessy's men attempt to track him in the woods, Quan uses traps to disable them but is shot in the shoulder and flees. After Quan ambushes Hennessy in his house, the latter sends his nephew Sean, a Royal Irish Regiment soldier, after Quan in hopes that his tracking skills can be used to stop him. After a second bombing on a double-decker bus, Hennessy negotiates with British politician Katherine Davies and promises the capture of the bombers in exchange for the pardoning of several of his former IRA comrades. Meanwhile, Hennessy receives intel on the bombers and relays the information to Sean and police. After a knife fight in the woods, Quan captures Sean, who names the bombers and their location before Quan lets him go. Hennessy interrogates his head enforcer McGrath, discovering that the true mastermind is Hennessy's wife who remains angry at the British for the death of her little brother and resents Hennessy's working for them. Hennessy executes McGrath for his betrayal and for involving his wife and mistress, then rebukes Sean for leaking information to Mary. As police prepare to raid the bombers' hideout, Quan enters the flat disguised as a handyman and kills everyone but Maggie. Quan leaves just before the police raid the apartment and find a severely wounded Maggie. They torture her into disclosing the location of their next bomb, which has been planted in a laptop computer to be detonated on a plane. British police find and throw the laptop into an empty jet bridge, where it detonates without casualties. With the threat resolved, Maggie is executed to prevent any "loose ends". Hennessy gets a call from Davies, who tells him that she has learned of his involvement but that he will retain his position as a politician, though under her thumb. Hennessy later executes Mary, eliminating the entire cell as a result. Quan confronts Hennessy with the picture of Hennessy kissing Maggie, which is enough to throw public suspicion on Hennessy and his role in the bombings. He forces Hennessy to post the picture to the internet and then returns home. Scotland Yard realizes Quan's role in the events and has him put under surveillance, but decides not to take any further action and thanks him for his assistance. Jackie Chan as Ngoc Minh Quan, a Nung Chinese former Vietnam War special forces operator turned London restaurateur in Walworth, who looks for revenge after his daughter is killed in a bombing. Pierce Brosnan as Liam Hennessy, the current Deputy First Minister of Northern Ireland and a former member of the IRA. Michael McElhatton as Jim Kavanagh, Hennesey's right hand man and head of security. Liu Tao as Keyi Lam, Quan's friend and co-owner of the restaurant. Charlie Murphy as Maggie Dunn/Sara Mackay, Liam's mistress and an undercover member of the Authentic IRA. Orla Brady as Mary Hennessy, Liam's wife. Katie Leung as Fan Quan, Ngoc Minh's daughter who is killed in a bombing by the Authentic IRA. Ray Fearon as Commander Richard Bromley, head of the Metropolitan Police Service's Counter Terrorism Command. Dermot Crowley as Hugh McGrath, an old associate of Hennessy's later revealed to be the Authentic IRA's leader. Rory Fleck-Byrne as Sean Morrison, an ex Royal Irish Ranger/United Kingdom Special Forces soldier and Liam's nephew. Lia Williams as Katherine Davies MP, a British Cabinet Minister. Pippa Bennett-Warner as Marissa Levitt, a Counter Terrorism Command detective. Simon Kunz as Matthew Rice, an MI5 interrogation expert. Niall McNamee as Patrick O'Reilly, an Authentic IRA cell member responsible for the 1st bombing which killed Quan's daughter. Caolan Byrne as McCormick, a member of the Authentic IRA terrorist cell. John Cronin as Denis Fisher, a member of the Authentic IRA terrorist cell. Stephen Hogan as Christy Murphy, another of Hennessy's bodyguards. Aaron Monaghan as Pat Nugent, the bombmaker for the Authentic IRA terrorist cell. David Pearse as Billy McMahon, one of Hennessy's henchmen. Mark Tandy as Simpson, a news editor and Wood's boss. Scott Sparrow as Daniel Barrie, a Counter Terrorism Command detective. Aden Gillet as Ross, an MI5 operational commander. 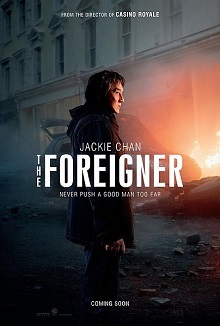 On 5 June 2015 it was announced that Jackie Chan would star in the action thriller film The Foreigner, for STX Entertainment, and based on Stephen Leather's novel The Chinaman. Nick Cassavetes initially signed to direct the film, which was adapted from Leather's novel by David Marconi, while Wayne Marc Godfrey was one of the producers. The film is partially set in Walworth, London. On 15 July 2015, Deadline reported that Martin Campbell was instead in talks to direct the film, while Relativity Media would finance. Pierce Brosnan joined the cast alongside Chan in November. Co-stars Liu Tao and Chan attended the Shanghai Film Festival on 11 June 2016 to promote the film. Principal photography commenced in January 2016. The filming in London of a scene involving the explosion of a bus on Lambeth Bridge caused some alarm, as people were not aware that it was a stunt. Scenes were shot at the Walters & Cohen designed Regent High School in Camden and on Churton Street in Pimlico on 18 February 2016. This marked the first time in which Brosnan starred in a film directed by Martin Campbell since the 1995 film GoldenEye. Cliff Martinez composed the score. The Fyzz Facility produced, and is distributing, the film, in association with Sparkle Roll Media and Huayi Brothers, while STXfilms distributes it theatrically across the United States of America. It was released on 30 September 2017 in China and 13 October 2017 in the United States. In the United Kingdom it was released on December 2017 on Netflix. A DVD and Blu-ray released in the United States on January 9, 2018 and January 23 in Canada and the rest of the world. The Foreigner grossed $34.4 million in the United States and Canada, and $111 million in other countries for a worldwide total of $145.4 million, against a production budget of $35 million. In the United States and Canada, the film opened alongside Happy Death Day, Marshall and Professor Marston and the Wonder Women, and was expected to gross $10–15 million from 2,555 theaters in its opening weekend. It made $4.8 million on its first day, including $855,000 from Thursday night previews. It went on to open to $15.5 million, finishing third at the box office behind Happy Death Day and Blade Runner 2049. On review aggregator website Rotten Tomatoes, the film has an approval rating of 65% based on 106 reviews, with an average rating of 6/10. The site's critical consensus reads, "The Foreigner adheres strictly to action thriller formula, but benefits from committed—and out of character—performances from its talented veteran stars." On Metacritic, the film has a weighted average score of 55 out of 100, based on 23 critics, indicating "mixed or average reviews". Audiences polled by CinemaScore gave the film an average grade of "A−" on an A+ to F scale, while PostTrak reported filmgoers gave it a 78% overall positive score. Peter Travers of Rolling Stone gave the film three out of four stars and praised Chan's performance, saying: "It's the most dramatic role Chan has ever tackled, and he plays it with coiled intensity and raw emotional power." Clarence Tsui of The Hollywood Reporter also praised Chan, writing, "It's good to see Chan swapping his happy-go-lucky persona for two hours for some gravitas as a tragic rogue with a marked past." ^ "The Foreigner". AMC Theatres. Retrieved September 19, 2017. ^ a b c "The Foreigner (2017)". Box Office Mojo. Retrieved 12 February 2018. ^ Giles, Jeff (October 12, 2017). "Happy Death Day Is Familiar but Fun". Rotten Tomatoes. Retrieved October 13, 2017. ^ "Harry Potter star Katie Leung takes the driving seat as she films action thriller The Foreigner with Jackie Chan". Daily Mail. Retrieved 19 February 2016. ^ "Katie Leung Official CV". Curtis Brown Agency. ^ a b Busch, Anita; Fleming Jr, Mike (5 June 2015). "Jackie Chan To Star in 'The Foreigner' for STX Entertainment". deadline.com. Retrieved 16 July 2015. ^ a b Fleming Jr, Mike (15 July 2015). "Martin Campbell in Talks To Direct Jackie Chan in STX Action Film". deadline.com. Retrieved 16 July 2015. ^ "《普通人》成龙 、刘涛亮相上影节惹欢呼_娱乐_腾讯网". 腾讯网 (Tencent Network). ^ "Movie's London bus explosion strikes fear of terror attack into public". The Guardian. 7 February 2016. ^ "'Happy Death Day' expected to unseat 'Blade Runner 2049' at the box office". Los Angeles Times. 11 October 2017. Retrieved 11 October 2017. ^ a b "Blumhouse Has Plenty To Smile About As 'Happy Death Day' Scares Up $30M+ Opening". Deadline Hollywood. Retrieved 14 October 2017. ^ "The Foreigner (2017)". Rotten Tomatoes. Retrieved 22 November 2017. ^ "The Foreigner reviews". Metacritic. Retrieved 15 October 2017. ^ "The Foreigner Review: Jackie Chan goes the 'Taken' route in Revenge Thriller". Rolling Stone. 11 October 2017. Retrieved 11 October 2017. ^ "'The Foreigner': Film Review". The Hollywood Reporter. 11 October 2017. Retrieved 11 October 2017.